While doing the research for All the Light There Was, I read memoirs by French singer and actor Charles Aznavour and his sister Aida Azanavour-Garvarentz. 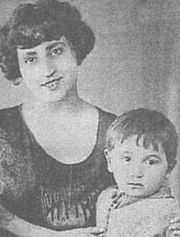 Aznavour, a son of Armenian immigrants, was born Shahnour Varenagh Aznavourian in Paris in 1924. Both memoirs briefly covered the war years, during which Charles and Aida were aspiring young entertainers. Their parents, who were Communists, participated in a circle of friends and political activists that included Missak Manouchian and his wife Melinée. The Aznavourian family’s contribution to the Resistance was inviting these soldiers to their home and trying to convince them to desert the German Army. If they agreed, the Aznavours would give them civilian clothes and help them to go underground. Charles Aznavour, who was nineteen at the time, was responsible for the nighttime task of dumping the deserters’ boots and uniforms into the sewers of Paris.